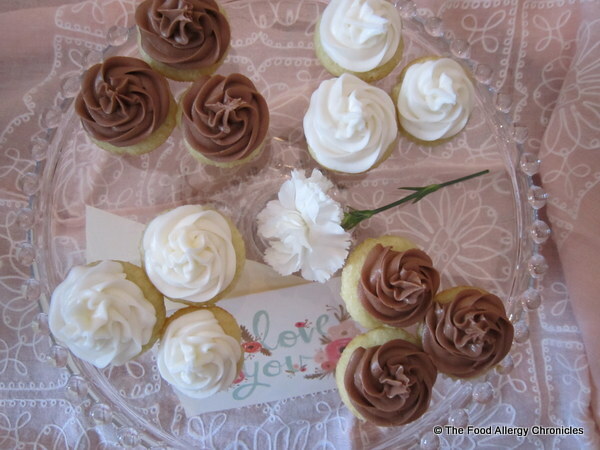 Posted on February 15, 2013 by Susan H.
Dairy, Egg, Soy and Peanut/Tree Nut Free Mini Vanilla Cupcakes. Sweets treats for my sweets! all ready to be dressed up with Dairy and Peanut/Tree Nut Free Chocolate Fondue! When it comes to chocolate vs. vanilla…Matthew is all about chocolate and Michael loves vanilla…this dessert pleased them both! 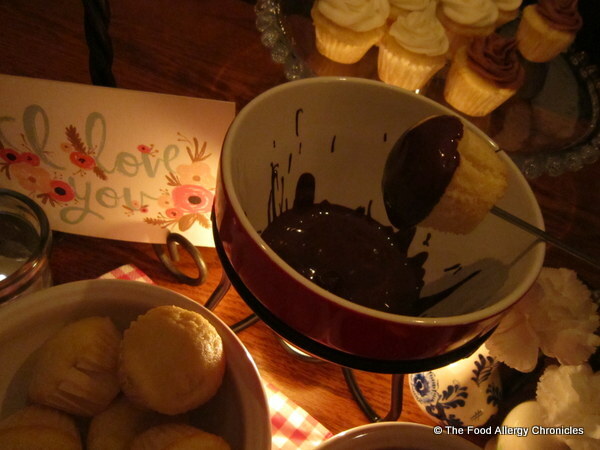 Expressing one’s love through food is a common theme…somewhat made difficult when one lives day-to-day with food allergies. Thankfully, there are yummy adaptions one can experiment with to create the dishes and treats your loved ones with food allergies will appreciate. Here’s wishing you all enjoyed a lovely evening with the ones you love! 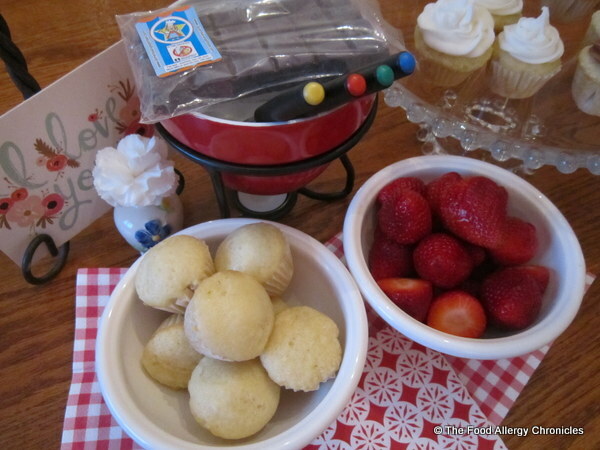 This entry was posted in allergies, baking, cakes, cupcakes, dairy free, dessert, egg free, multiple food allergies, peanut/tree nut free, soy free, Valentines and tagged dairy, Dairy and Peanut/Tree Nut Free Chocolate Fondue, egg, Guardian Angel Chocolate, Guardian Angel Chocolate for fondue, Soy and Peanut/Tree Nut Free Mini Vanilla Cupcakes with Vanilla and Chocolate Icing by Susan H.. Bookmark the permalink. These are beautiful, and so sweet. I love that they’re mini. Thank you!